The Globe Theatre Reconstruction was a massive and difficult project. 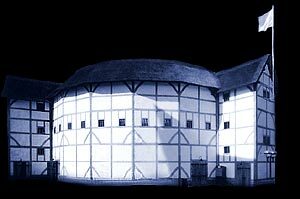 It was vitally important to build the replica as an authentic reconstruction of the Globe Theatre of William Shakespeare. The black and white timbers of the architecture immediately conveys everyone's perception of the architecture of Tudor & Elizabethan England. The new Globe Theatre creates an imposing picture which can be seen on land or from the River Thames. The thatched roof of the new Globe Theatre was made in traditional style with Norfolk reeds although it was coated with a special fire-protective liquid. The new Globe Theatre is the first thatched roof building that has been allowed in London since the Great Fire of London in 1666. Not one inside picture of the old Globe Theater is in existence, however, a picture of the Swan Theatre has survived. In 1596 a Dutch traveller called Johannes de Witt attended a play at the Swan Theatre in London. De Witt made a sketch of the interior of the Swan. A friend of Johannes de Witt called Arend van Buchell copied the sketch and de Witt added this drawing to his diary. His diary is probably the single most important source of information regarding the internal layout of London theatres and has no doubt helped with the Globe Theatre reconstruction. Other important sources of information are the illustrated map views of the period which pictures London when the original Globe Theatre was still in existence. The picture of the map by Claes Van Visscher clearly shows the architecture and location of the old Globe Theatre. Other significant map views are the Hollar, the Agas and the Norden. Existing buildings from the period of the old Globe theatres including the 2 storey octagonal market at Wymondham in Norfolk, England and the Queen's House in the Tower of London were also closely studied. Scholars and architects looked at the information available regarding the building and the structure of the old Globe theatre and plans to build a replica, a reconstruction, of the old Globe theatre were drawn. Excavation works for the New Theater Excavation of the site began in 1987 The "diaphragm" wall, on the side of the theatre closest to the Thames, was constructed to keep the water out. Interesting Facts and information about the Globe Theatre Reconstruction. Additional details, facts and information about the Globe Theatre can be accessed via the Globe Theatre Sitemap.